Morphe Brushes is a brand that everyone raves about, mostly because you get great products – either brushes or eyeshadows – for a greater price. Being in the UK it gets quite difficult to get these products since they are based in the US but luckily I discovered Beauty Bay. I am sure that I am way to late talking about this website but I only find it recently when I was googling “Morphe Brushes UK”. At first I wasn’t too sure if I could rely on this website so I ordered only two morphe brushes just to kind of test it out. They did arrive safely and I loved the quality of them – this first time I bought M504 and M505, a large and mini blending brush. As I absolutely loved the quality of them, I couldn’t resist and I just wanted more and more, even though I believe that I have enough brushes. So this time I wanted some face brushes. Specially to apply my foundation and concealer as I have been using the miracle sponge by Real Tecnhiques for ages now and I was in need for something different. Browsing through the huge amount of brushes that you are able to purchase from Beauty Bay, I found a 6 Piece set that looked great and just what I needed – the 690 Deluxe Contour Set. 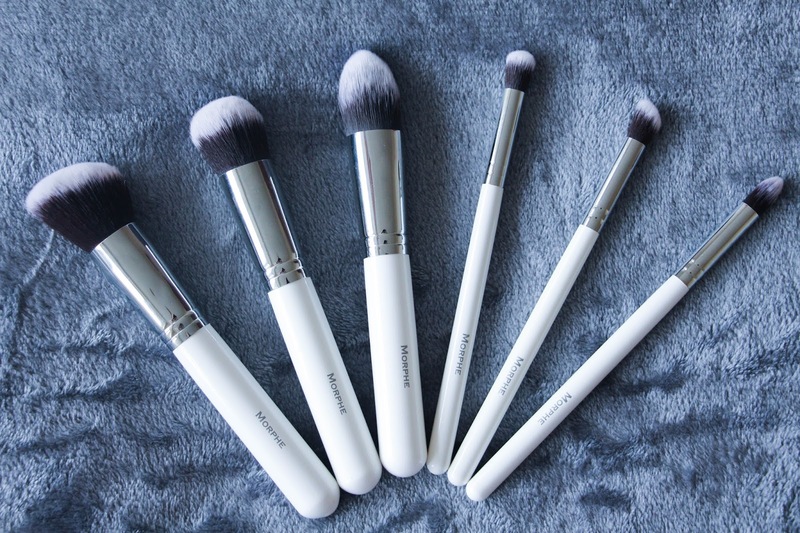 Six perfectly white looking brushes for only £18. For me, this is a bargain. So I went ahead and bought them. I got them in the mail a couple of days after the purchase, which is amazing! I have to say that Beauty Bay is becoming one of my favourite places to buy makeup online, for sure. Anyways, I got them in the mail last week and even though I have not used all of them, I have tried three of six brushes from this set and I feel like it is more than time to review them. According to the description of these 6 brushes, they are supposed to give you a flawless contoured look. Noticing how dense they are, I think that they would be appropriate to work with cream contour. Not having any cream contour kits in my makeup collection, I can’t say much about that. But, I know that you can use your brushes for whatever you like and so that is what I did. Anyways, in this kit you get and Angled Buffer Brush, Round Buffer Brush, Pointed Contour Buffer Brush, and a mini of each one of the previous (so, a mini angled buffer brush, mini round buffer brush and mini pointed contour buffer brush). I have only used three or four brushes from this set and I have been loving it. I must say that after applying my foundation with my one and only miracle complexion sponge it feels quite strange changing to a brush but you quite easily get used to it with these amazing brushes. To apply my foundation I have been using either the angled or the round buffer brush. They are both dense, fluffy and smooth so they blend your makeup into the complexion effortlessly giving you an airbrushed finished. I love the finish of the foundation on my face when using any of these two brushes. It blends everything so smooth and easily! For my concealer – and I have been looking for a brush like this for a while! – I have been using the pointed contour buffer brush. The main reason why I love this one apart from, again, being soft, smooth and dense is the fact that it is pointed. And that tip can get to the inner corner of your eye so easily, making sure that the concealer is applied evenly on your under eye area. I have been loving this one, it is probably one of my favourite brushes from this set and I can’t live without it! The other three smaller brushes are the ones that I have not used the most. I have tried the mini angles buffer brush to apply my powder contour to my nose and then I used a fluffier brush to blend it and it worked fantastically. These three brushes are again dense and small enough to apply powder or cream contour in a controlled, precised and easy motion. I can even say that the mini pointed contour buffer brush could be used to apply your concealer in the inner corner of your eye if you are applying it after your eye makeup is done and you need to be very precised. Summing up all this chit chat going on here I think that this is a great kit if you are in need for face brushes, either to apply your foundation, concealer or even cream contour if you wish. A bit more difficult to work with powder with them as they are so dense and I think it won’t blend powder so easily. But, to place the powder where you want it to them blend with a different brush, they would work as great! I have been loving using these brushes for foundation mostly and I know that sooner than later I will have the need to buy more, more and more. I need to control myself! What about you, which one is your favourite Morphe Brush?